We are an independent high street optician, located in the centre of the attractive market town of Wigton, Cumbria. Established originally in 2002, we have a team of dedicated professional staff to help you with all your eye care needs. Our approach is to stay in touch with current trends in spectacle frames and remain up to date with the latest technology in eye examinations by regularly investing in advanced modern equipment, attending refresher courses and seeing what’s new at optical trade fairs. Fiona Trotman is our fully qualified optometrist and owner, registered with the GOC and AOP. Originally from Cumbria she has been practising for over 30 years. 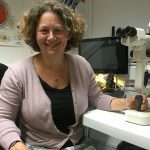 After qualifying in 1986, she continued to work in a small independent group practice in London and Kent and as a sessional optometrist in Moorfields Eye Hospital Contact Lens Department. In the early 1990s she spent two years working in Tasmania, Australia. Returning home to Cumbria in 1993, Fiona worked in a number of practices before becoming a director of Hollinshead and King Opticians in 2011, taking over the practice fully in 2018 with her husband, Jonathan Trotman, who takes care of the administration side of things. Allison Cockburn provides us with excellent optometrist cover and is very much part of the team. She too is a fully qualified optometrist, registered with the GOC and AOP. Sarah Carruthers is our fully qualified dispensing optician, registered with both the GOC and ABDO. 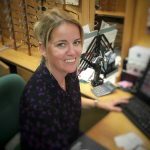 She has worked in optics for 21 years in various practices throughout Cumbria and South West Scotland, including 10 years in practice management. She lives locally on a farm in Kirkbride with her husband Adrian and their young family. Sam Hobden and Dianne Young are our part time dispensing opticians, also fully qualified. Our support staff are Joy, Dot and AnneLouise who have many years experience between them in answering with your requests or queries, making appointments and generally looking after the smooth running of the practice.